Mealtimes just got easier with the Graco Souffle, the highchair with an easy, two-step fold. Not only is it super-simple to fold, it features a slim design that is self-standing, making it perfect for storing in between mealtimes. 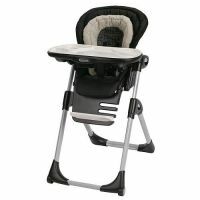 Everything about this full-featured highchair is convenient: the one-hand removable tray with dishwasher safe insert easily snaps onto the frame and folds with it, for all-together storage. It features wipable and machine washable seat pad, comfy infant support and reclining seat, harness covers and adjustability for different mealtime needs. Enjoy mealtimes, then fold, stow and forget it until next time. Easy! 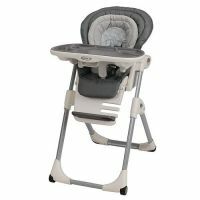 To Recieve updates and possible rewards for Graco Graco Souffle High Chair - Sutton please sign in. To Recieve updates and possible rewards for High Chairs please sign in.